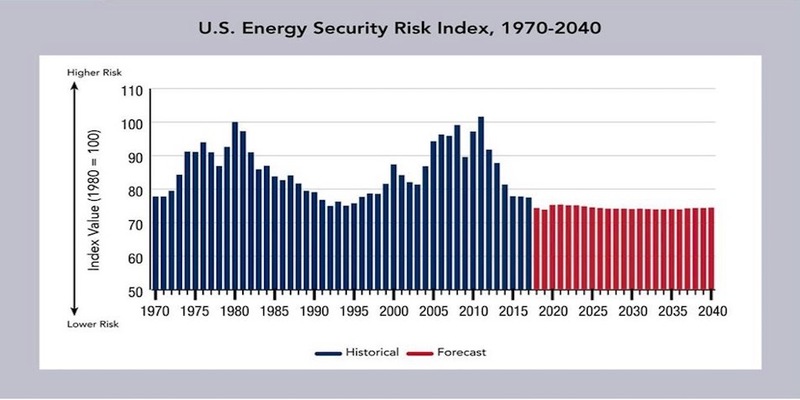 America’s energy security risk score dropped for the sixth consecutive year in 2017, nearing the best score since 1970 according to the Global Energy Institute’s just-released 2018 Index of U.S. Energy Security Risk. The Index employs 37 different energy security metrics measuring geopolitical, economic, reliability, and environmental risks. The ninth annual edition of the Index covers historical data from 1970 to 2017 and forecast data out to 2040. Like a golf score, the lower Index score, the better our energy security. In 2017, the U.S. total energy security risk score edged slightly downward to 77.5, its lowest score since 1995. While the change in 2017 was a relatively modest 0.4% from the previous year, it’s part of a longer trend of lower total risk scores now stretching into its sixth year, the longest period of declining risk in the record. The direct and indirect impacts of the revolution in unconventional oil and natural gas production are largely responsible for this remarkable and unprecedented run of ever lower risks scores. Improvements in energy efficiency and environmental metrics also contributed. Energy security risks fell for the sixth year in a row in 2017: After achieving a record high risk score in 2011, the total U.S. energy security risk score fell for the sixth consecutive year in 2017—the longest streak of annual declines in the Index database—dropping to 77.5, its lowest level since 1995. Total risk score has plunged 24 points since the 2011 record-high score: In the six years since the U.S. risk score peaked in 2011, it has tumbled 24.1 points, a rapid rate of decline that is unprecedented. By comparison, it took twice as many years—from 1980 to 1992—for the risk score to fall 25 points to the historic low of 75.1. Barring unforeseen events, even further declines are anticipated. Natural gas import risk fall to “0”: Natural gas imports risks fell to zero on the back of surging domestic production that in 2017 made the United States a net exporter of natural gas for the first time since 1957. U.S. energy security risk score for 2018 is expected to achieve a record low: The outlook suggests that the United States will have a record low risk score (between 74 and 75 points) in 2018 as the impact of the large crude oil price spike in 2015 dissipates, price volatility returns to a low level, and current trends in domestic energy production and energy efficiency proceed as expected. Risks expected to stay very low out to 2040: Based on EIA’s AEO2018, we expect an average U.S. risk score of 74.4 from 2018 to 2040, ranging from 75.4 to 74 (which would be a new record low). There is nothing comparable to such prolonged period of risk scores below 80 points in the Index database going back to 1970. As we know from history, however, unexpected events are almost certain to occur that will impact future risk scores. The forecast suggests three additional metric risks scores are expected fall to “0”: In addition to the metric for natural gas import risk, which reached a score of zero in 2017, the risk scores for three other import-related metric s also should reach zero sometime before 2030: petroleum import risk (in 2018); oil and natural gas import expenditures (2025); and oil and natural gas import expenditures per GDP (2025). As this latest edition of the Index shows, the outlook for our future energy security is as bright as it has been since we started measuring it back in 2010. And while we may not be able to predict future geopolitical events with any confidence, we clearly are in a much better position to deal with the inevitable crises—like instability in Venezuela or the Middle East-- that will crop up so that they will be less disruptive to our economy and security. The Index and its companion, the International Energy Security Risk Index, are available on our website at www.globalenergyinstitute.org/energysecurity. Thanks to increased oil and gas production here at home - America’s energy security nears record best!